Refugees and gods always compete for the same place. Born in Baddawi refugee camp in Lebanon, Yousif M. Qasmiyeh is a Palestinian poet and translator who currently teaches Arabic at Oxford University. His poems, translations, and essays have appeared in Arabic in An-Nahar and Al-Ghawoon, and in English in journals including Critical Quarterly, GeoHumanities, and Modern Poetry in Translation. Much of his recent research, as the Writer in Residence for the Refugee Hosts Project, focuses on ‘writing the camp’ and the dialectics of hospitality in both life and death. Last year, Qasmiyeh collaborated with the Oxford University Poetry Society, the Oxford Students’ Oxfam Group and Oxford University PEN to translate Arabic-language poems pertaining to the Syrian refugee crisis for a small anthology, Flight, subsequently sold to raise funds for the Oxfam Refugee Appeal and an Oxford-based charity, OXPAND. It was in this capacity that I first met Qasmiyeh. The following exchange took place in late January, 2017. Theophilus Kwek (TK): You’ve just returned from Oxford to Lebanon for several weeks over the winter, visiting the refugee camps while you were there. Each of these journeys must involve a complex set of changes: not least in your immediate linguistic and cultural context. Was there an aspect of this most recent journey that was most compelling to you as a writer? 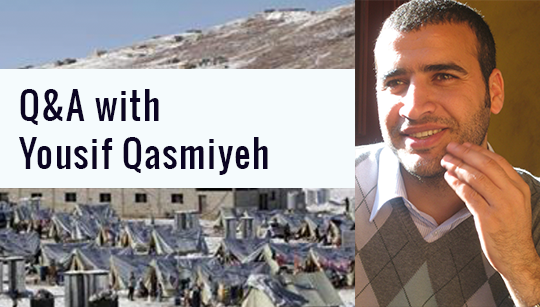 Yousif M. Qasmiyeh (YMQ): These journeys have become regular since I obtained my British passport in early-2012. Their regularity is largely initiated by a combination of familial and research commitments. I mainly visit Baddawi camp (my place of birth) and the Nahr Al-Bared camp in North Lebanon. We might say that I go to the camps ‘through Lebanon’ and never ‘to Lebanon’. Indeed, this has been a recurring theme in my and Elena’s research with new [refugee] arrivals in Baddawi, in so far as refugees’ “arrival in the camp” has become the ultimate dynamic that has punctuated many refugees’ understanding of the occurrence of arrival [in Lebanon]. When I am there I try to spend time with my elderly parents, my siblings and their families, but I also try to observe the changes that are occurring in the camps. The camps are no longer the same nor are their residents the same people. In order to acknowledge both the humane and inhumane repercussions of such places we have to see the faces in their absolute gift—the features and cuts that never lie about what is happening around them. These are the faces of those who are unsure about the definition of a place or the tenets that make a place a place. Everything in the camps seems to move both horizontally and vertically at the same time. People enter the place to contribute to the mass or masses therein but also to the verticality that has embodied itself in all these fragile buildings that are being (or in the process of being) built. Other refugees are entering their archetypal place, one might say. The city (at least in Lebanon) is no longer the only destination for all these new refugees. In this process, I think the linguistic and dialectal dimension has become strikingly obvious. The dialects that are heard are now what avows the faces. Palestinian, Syrian, and Iraqi dialects are now uttered in the same space, in camps that have transcended the “gathering” sign to become the “gatherer”; the active participle, the doer whose main presence is dependent on being occupied and used. We hear the dialect to observe the face. This (dis)order has always attracted me to my camp. It attracts me for it is the dialect that we at times suppress to conceal who we are. It attracts me when such dialects are exaggerated or perhaps elongated to occupy a place that is neither theirs nor ours. The shibboleth has never been clearer.